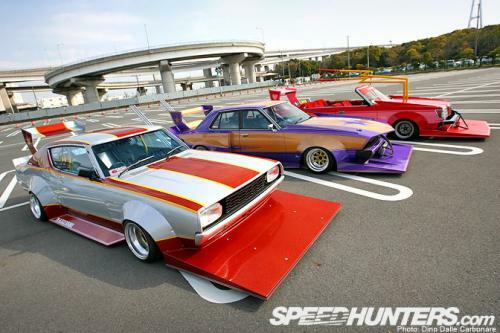 Japanese bosozoku culture has always been of great interest to me, with the wildly styled motorcycles and other vehicles representing something drastically different to any other form of automotive aesthetics. 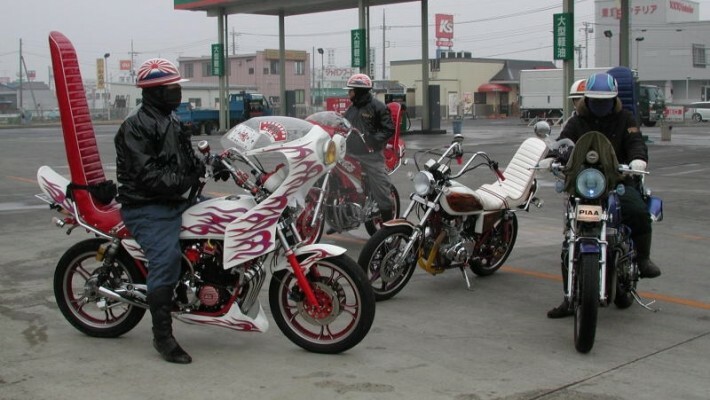 Akin to outlaw motorcycle gangs of other nations, bosozoku gangs are notorious for their rebellion against mainstream Japanese culture through the creation of public disturbance. This usually involves large groups of riders holding up traffic and generally disobeying road rules, all whilst revving their engines to create as much noise as possible. Whilst regularly present on the streets of Japan, I would define bosozoku culture as peripheral to the mainstream, and the way in which their activities are digitally distributed through videos furthers the performative spectacle that they pursue. In this way, the bosozoku do not suffer from ‘voice poverty’ as discussed by Tacchi (2009), instead using digital storytelling to further showcase their performative rebellion. For this reason I believe that the bosozoku buck the trend described by Russo & Watkins (2005) of ‘digital literacy’ allowing peripheral communities to break free of an institutionalised cultural custodian, as this was already the goal of the bosozoku prior to the digital age, with digital media simply offering them another channel through which to do so. What has been enabled by digital storytelling, however, is an insight in to the mindset of the bosozoku, personified by self-professed delinquent Shinichi Moroboshi in the above interview. This video in particular gave me a much deeper insight in to the cyclical nature of bousou; with the spectacle created inspiring impressed onlookers to in turn become part of bosozoku culture. The performative nature of bousou is highlighted by the styling of Shinichi-san’s Lamborghini, a car purchased to fulfil a dream inspired by a similar vehicle he had observed in his youth. This vehicle, traditionally owned by the elite, has been modified to represent the bosozoku counter-culture, with the loud exhaust and illuminated interior demanding the attention of all that encounter it, and possibly providing inspiration for those aspiring to participate in bosou. Analysing the above expression of my own understanding of bosozoku culture, I realise that language-based issues of access have largely shaped my depth of knowledge. While the second video I presented is participatory in the sense that individuals who are essentially outlaws have participated in the creation of media that offers insight in to their culture (try that with an Australian OLMC! ), it is a digital artefact prepared by a New Zealand native with the intention of conveying this insight to an English-speaking audience. More authentic digital artefacts created by those within bosozoku culture, such as the first video presented, point to a community that must exist in a nation that is far more digitally advanced than my own, but a community that is inaccessible to me due to a language-based cultural divide. I do not wish to discount the absolutely spectacular work of Luke Huxham, responsible for large chunks of my Japanese cultural understanding, but wish to use a contrast of the two videos to highlight the way in which participatory digital storytelling can have varying levels of external influence, raising questions of authenticity. I believe that this specific example provides a fascinating account of the bosozoku mindset, but also understand that the gaps I have highlighted in my own knowledge exist because of my inability to further engage with bosozoku culture in its native language. ← Ouran High School Host Club… again. I saw a guy revving his dirt bike and popping wheelies around uni today which reminded me of Bosozoku, which led to me contemplating it as a cultural phenomenon all the way back to my car. On the surface it looks like a bunch of hoons just being loud and outrageous for the sake of it, generally being badass and not caring what people think. But clearly there is a strong sense of community in that first video, something deeper than just hooning about. I’ve seen that second video heaps of times now, and love it every time. But I think it reveals a darker side to these groups, operating in a legally grey area. I think your comparison of Motorcycle clubs in Australia is one worth making, I’ve seen some video’s pretty similar in style to the first one (https://www.youtube.com/watch?feature=related&v=-aRyzr_4X6E&app=desktop) but none made with quite as much style as Underground Hero Short film.